RANGERS MANAGER STEVEN Gerrard has backed calls from Scottish players’ union to ban plastic pitches from the Scottish Premiership and is even open to his club and rivals Celtic funding the change. A quarter of Premiership games will take place on plastic surfaces this season with Kilmarnock, Hamilton and Livingston all using artificial pitches. In a survey from players at the other nine Premiership clubs with grass pitches, PFA Scotland said on Thursday there had been a 100 percent response against the use of plastic pitches. Earlier this season, Ajax, PSV Eindhoven and Feyenoord agreed to give up some of the money they earned from playing in Europe to get rid of plastic pitches in the Dutch top-flight. And Gerrard said he would be in favour of the bigger clubs in Scotland doing the same. “These games are going out worldwide. We’re trying to attract top players to the league and improve the standard,” said the former Liverpool captain. “Every other elite league plays on grass, so why shouldn’t Scotland? I’m sure there are different ways, whether it be TV, the PFA, the SFA or bigger clubs trying to support other clubs. I’d be all for that because I think football at the top level should be played on grass. Gerrard has been an outspoken critic of the Astroturf pitches in his first season in Scotland after Rangers winger Jamie Murphy suffered a serious knee injury in a League Cup game at Kilmarnock in August. “I don’t like plastic pitches, I didn’t like playing on them. I think they’re dangerous,” he added. I respect the teams that have put them in place for financial reasons – but for me having been a player and now being a coach, I believe the game would be in a better place if there was no plastic pitches. Email “Steven Gerrard wants to tear up Scotland's plastic pitches”. 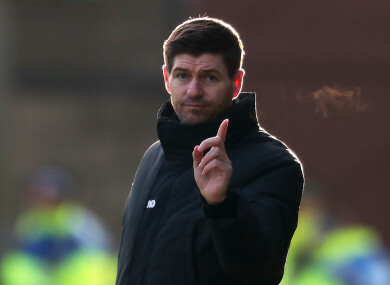 Feedback on “Steven Gerrard wants to tear up Scotland's plastic pitches”.